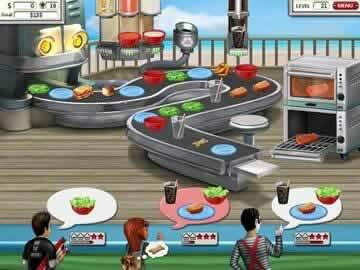 Burger Shop 2 Game - Download and Play Free Version! 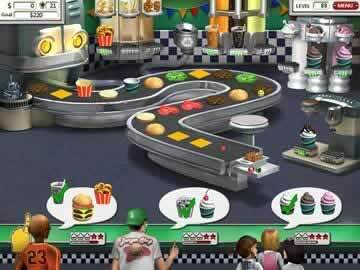 Learn the Real Meaning of 'Fast' Food by Recreating Your Burger Empire With Your Mad Clicking Skills! The amazing success of your BurgerTron 2000 machine comes to a sudden end when you wake up in an alley with a bump on your head. When you return to your burger empire, it's destroyed! As you buy back your restaurants and get to work on regaining your prestige in the burger business, you can't help but wonder what happened and why? Will you ever find out? 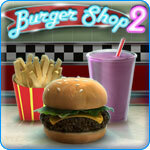 Enjoy 120 levels and four game modes in this entertaining sequel to Burger Shop! Create Many Types of Food as Fast as You Can! This amusing time management game will have you clicking madly for hours to create the perfect meal for each customer. When a customer appears and orders via the icons above his head, click on the parts of the meal on the conveyor belt to fill the order. For example, when a customer orders a cheeseburger, you must find and click on a plate, a top bun, a bottom bun, a hamburger patty and a piece of cheese. Some foods need to be cooked in the oven, like steak, or prepared through various steps, like cereal with milk. Try not to let any customers leave angry! The faster you serve them, the better tips they'll leave. Earn a new type of food every level and serve 100 different items ranging from chocolate ice cream to chicken burgers to soup as quickly as you can! The interactive tutorials are very helpful and make learning how to play this game easy. The hilarious narrations make this game even more irresistible and entertaining! Once you've beaten Story Mode, try the very challenging Expert Mode, Challenge Mode to see if you can get a gold rating in every restaurant and Relax Mode so you never have to deal with angry customers. Do you have the skills to recreate your incredible burger empire? Challenge yourself with Burger Shop 2!